Celtic were once again the biggest movers and shakers in the Scottish Premiership during January, finishing with a flamboyant flourish by trading in a moody Turk who has been a flop in Glasgow for a moody Englishman who made his name playing for Turkey. 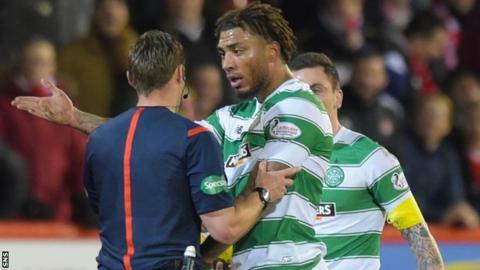 As Nadir Ciftci sloped off to Eskisehirspor on loan, fellow forward Colin Kazim-Richards, formerly of Fenerbahce and Galatasaray, arrived from Feyenoord just as his suspension for threatening a journalist came to an end. Whether or not either Turk will delight enough to be hits with their new clubs, it is another loanee who has the potential to set Celtic Park alight if he lives up to his market value. Patrick Roberts moved to Manchester City in the summer for about £12m and the 18-year-old winger has 18 months with the reigning Scottish champions in which to prove himself worthy of the fee paid to Fulham. Kazim-Richards is perhaps even more of a gamble, not only because of his off-field antics but also for a lack of career goals, and steady Erik Sviatchenko is maybe a safer bet to prove worthy of the £1.5m Celtic paid Midtjylland for the Denmark defender. Celtic might need to squeeze every last pound of value out of their new arrivals to thwart a sustained Aberdeen title challenge that appears to have surprised even those inside Pittodrie. The Dandies' deadline-day signing of Simon Church on loan from MK Dons means they have a striker hungry for goals to ensure his place in Wales' Euro 2016 finals squad. However, the Dons may live to regret their bungled attempt to sign Greg Tansey from Inverness Caledonian Thistle in events that left them minus the additional cover in central midfield manager Derek McInnes thought necessary. While they brought in two replacements, the recall by Liverpool of promising goalkeeper Danny Ward could also prove costly in the long run. Third-top Hearts made the biggest profit during January as they arranged a deal that should mean they pocket more than £1m for the sale of Osman Sow to Henan Jianye, who also bought Ryan McGowan from Dundee United, as the Chinese Super League begins to flex its financial muscle. The Edinburgh club have replaced the Swede with Abiola Dauda, a Nigerian striker on loan from Vitesse who has an even more impressive scoring record. Elsewhere, there was the usual influx and exchange of journeymen pros, with Dundee United failing to make the kind of exciting acquisitions that will transform their fans' hopes into expectation that they can bridge the gaping points gap at the bottom of the table. In: Aaron Lennox, goalkeeper (Hayes & Yeading). Loan:Simon Church, forward (MK Dons); Adam Collin, goalkeeper (Rotherham United). Out: Paul Quinn, defender (Ross County). Loan ended:Danny Ward, goalkeeper (Liverpool); Ryan McLaughlin, defender (Liverpool); Josh Parker, midfielder (Red Star Belgrade). Loan:David Goodwillie, forward (Ross County); Scott McKenna, defender (Alloa Athletic); Lukas Culjak, defender (Brechin City); Jamie Henry, midfielder (Arbroath). In:Colin Kazim-Richards, forward (Feyenoord); Erik Sviatchenko, defender (Midtjylland, £1.5m). Loan: Patrick Roberts, midfielder (Manchester City). Out: Loan: Nadir Ciftci, forward (Eskisehirspor); Anthony Stokes, forward (Hibernian); Aiden Nesbitt, forward (Partick Thistle); Jack Breslin, defender (Annan Athletic); Colin McCabe, goalkeeper (Stenhousemuir). In:Darren O'Dea, defender (Mumbai City). Loan:Arturo Juan Rodriquez Perez-Reverte, forward (Cordoba). Out:Kevin Thomson, midfielder (Hibernian); Gary Irvine, defender (St Mirren). Loan ended: Riccardo Calder, defender (Aston Villa). Loan: Josh Skelly, forward (Arbroath); Sam Dryden, defender (Elgin City). In:Eiji Kawashima, goalkeeper (Standard Liege). Loan: Riku Riski, forward (Rosenborg); Kyle Knoyle, defender (West Ham United). Out:John Souttar, defender (Hearts, undisclosed); Ryan McGowan, defender (Henan Jianye, undisclosed); Aidan Connolly, midfielder (Raith Rovers); Marc McCallum, goalkeeper (Livingston); Evan Home, midfielder (Dunfermline Athletic); Scott Smith, midfielder; Scott Lochhead, midfielder. Loan:Charlie Telfer, midfielder (Livingston); Euan Spark, defender (Forfar Athletic); Alistair Coote, midfielder (East Fife). In: Oumar Diaby, forward (Levski Sofia); Christopher Mandiangu, forward (Eindhoven). Out: Christian Nade, forward (Dumbarton); Andy Ryan, forward (Forfar Athletic); Jamie Sendles-White, defender (Swindon Town). Loan: Louis Longridge, forward (Raith Rovers); Scott McMann, defender (Clyde). In:John Souttar, defender (Dundee United, undisclosed); Don Cowie, midfielder (Wigan Athletic); Jon Daly, coach (Raith Rovers). Loan:Abiola Dauda, forward (Vitesse Arnhem). Out:Osman Sow, forward (Henan Jianye, £1m); Danny Swanson, midfielder (St Johnstone); Scott Gallagher, goalkeeper (Alloa Athletic); Kenny Anderson, midfielder (Waalwijk). Loan:Morgaro Gomis, midfielder (Motherwell); Billy King, midfielder (Rangers). In:Ryan Williams, midfielder (Brentford); Liam Hughes, midfielder (Cambridge United); Alex Fisher, forward (Torquay United). Out: Dani Lopez, forward (Arenas). Loan ended: Ryan Christie, midfielder (Celtic). In:Gary Dicker, midfielder (Carlisle United). Loan:Lee Hodson, defender (MK Dons). Out: Theo Robinson, forward (Port Vale); Craig Reid, defender (Dunfermline Athletic); Dan Twardzik, goalkeeper. Loan ended: Liam Grimshaw, midfielder (Manchester United); Jake Taylor, midfielder (Reading). Loan: David Clarkson, forward (St Mirren); Dylan Mackin, forward (Airdrieonians); David Ferguson, defender (Airdrieonians). In: Antonio German, forward (Karela Blasters). Loan: Aiden Nesbitt, forward (Celtic). Out: Ryan Stevenson, midfielder (Ayr United). Loan ended: Robbie Muirhead, forward (Dundee United). Loan: Declan McDaid, midfielder (Cowdenbeath); Michael McMullen, defender (East Stirlingshire); Marc Waters, goalkeeper (Clyde). In: Paul Quinn, defender (Aberdeen). Loan: David Goodwillie, forward (Aberdeen). Out: Rocco Quinn, midfielder (St Mirren). In: Danny Swanson, midfielder (Hearts); Michael Doyle, defender (Alloa Athletic). Out: Michael O'Halloran, forward (Rangers, undisclosed); Liam Caddis, midfielder (Alloa Athletic); Gareth Rodger, defender (Forfar Athletic). Loan: Brad McKay, defender (Dunfermline Athletic); Ally Gilchrist, forward (Peterhead); Neil Martyniuk, defender (Montrose); George Hunter, forward (Spartans).